Hi tweed heads, I wanted to share some photos of one of my favorite vintage Harris Tweed acquisitions from the past couple of years. It's a green barleycorn pattern with a subtle over check in blue, red, gold and rust. Given the way this jacket is cut the very subtle blue and red alternates on the horizontal while the Gold and Rust alternates on the vertical (I will provide close-ups below to help you spot the colors). One of the things that I love about tweeds in general and about Harris Tweeds, in particular, is the color details you can find in the weave. To me, it's quite frankly almost mesmerizing. Tweed looks great from across the field or town square and the closer you get, the better it looks - nearly to the granular level, to me it's just a feast for the eyes. Any lover of tweed will know exactly what I'm on about. So in order to celebrate the beauty of this fine fabric, I intend in my tweed reviews to include some wide, medium, closeup, and even super close-ups so that my fellow tweedheads can enjoy these marvelous weaves to their fullest (dare I say 'tweedgasm'?). No, I dare not - but I'll write it. This jacket came to me, like many good things in this, our modern age, via the worldwide purveyors of goods of all description - E.& Bay. And I will say here, that this can be a fantastic way to get your hands on some wonderful tweeds. Just search 'Harris Tweed' and your jacket size and like magic hundreds of possibilities appear before your very eyes; each one more beautiful and alluring than the next. But like living next to a Whisky store on one side and a high-class bordello on the other, self-control and moderation must be exercised, lest one find oneself both broke and divorced (discretion dear readers, discretion and self-control!). This beautiful weave, I know not when it was woven nor when the jacket made-up. If I had to guess, based upon the cut and general condition, I would say the in this current century, as there doesn't seem to be anything particularly untoward about the cut, neither too wide or narrow of lapel or to wide of shoulder (I tend to avoid too wide lapels or very low button stances, too padded shoulders, etc.). The leather buttons show some slight wear, but otherwise, I think it looks very snappy. The most important thing you need to know is your measurement!! And the best way to get them for the purposes of buying online is to take them off a jacket that you own and of which you like the fit. There are only about 5 you'll really need to have (I recommend writing them down and keeping them handy). All these can be taken with a standard household measuring tape or a tailors tape either will work. Lay the jacket you wish to measure on the bed or other flat surface or hang it on a hanger and hang that from the back of a door and button the center button. 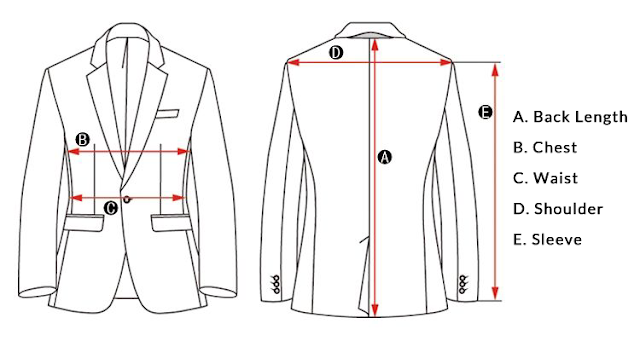 A= Back length - Center back from top of collar to hem of the jacket or sometimes from the bottom of collar to hem of the jacket - this depends on the purveyor. C= Waist - Across jacket at the narrowest point -typically the top or center button level. D= Shoulder width - From seam where the top of sleeve attaches across to the seam of the opposite sleeve. F = Not depicted below, but sometimes given - Underarm sleeve length (from pit to sleeve cuff). That's it! Most eBay sellers (and this is true of Germany, England, and American eBay sites) will provide this information (although in Germany, the measurements are given in centimeters) and if they don't for whatever reason have it on their listing, just move on, they are not serious sellers, and I probably wouldn't trust them to get the measurements done correctly. 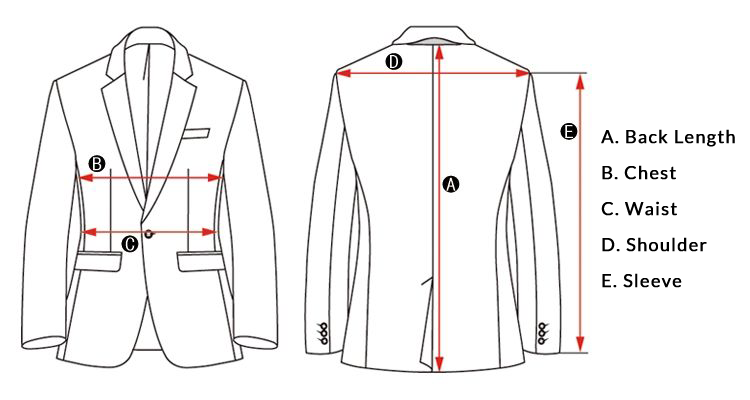 With these measurements, you can purchase a jacket or sports coat and be reasonably certain that it will fit or be with able to fit with some minor tailoring. Now I'm OK with more of a modern fit for lightweight summer jackets, but for tweeds, I really would like to layer my look, so if it's a bit snug in the chest, too narrow of shoulder or slim of sleeve, wearing an Aran or Fair Isle jumper under it has been rendered impossible, without me looking like an overstuffed sausage. This makes the vintage/traditional cut far preferable than what you'll often find today even if I go up to a 44R and sometimes a 46R. At the end of the day, I know that if the jacket has the above measurements I'm golden. The last thing I would say is to look very closely at the photos and carefully read the description provided by the seller of the condition of the item. 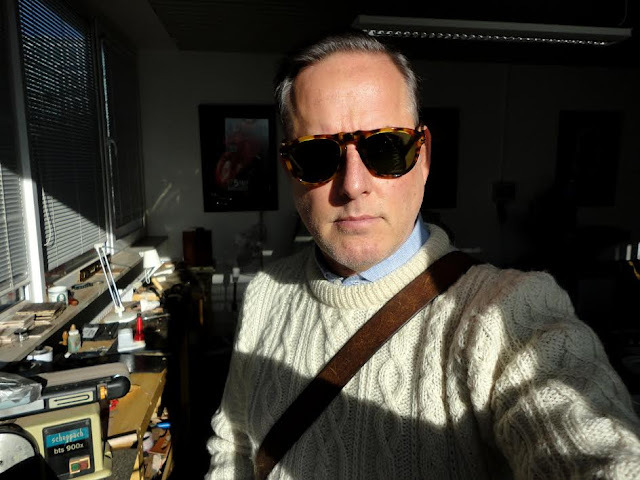 Many of these sellers specialize in selling men's wear and tweed jackets (especially in the UK eBay) and so are fastidious about providing details about their wares. It best to know the condition of the item before you bit! Good luck and happy hunting!